The “recipe” is truly simple…little more than a deconstructed BLT with avocado. 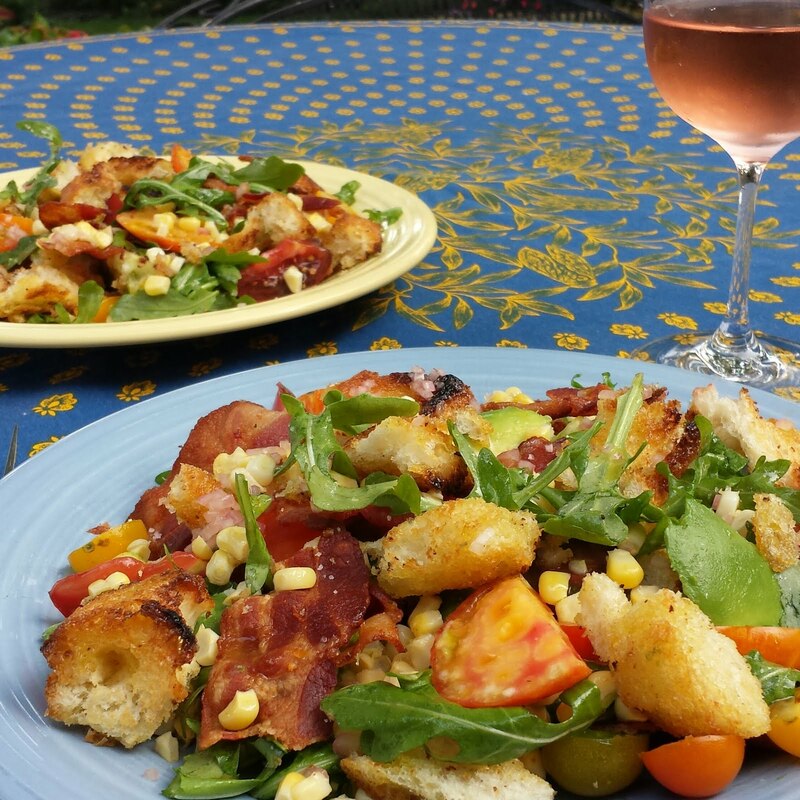 It is actually a bit like Panzanella in that there is much more bread than one finds in a typical salad. 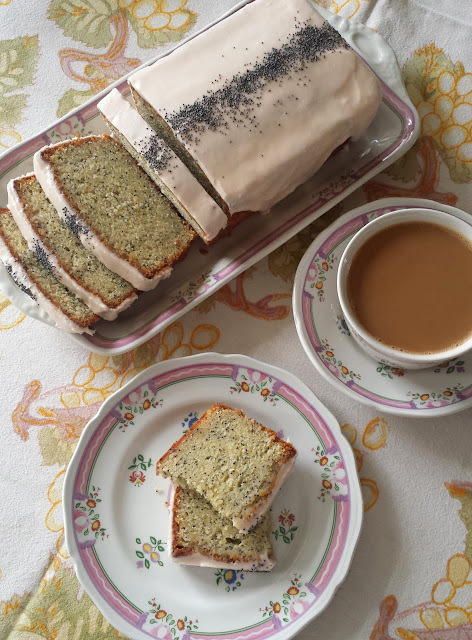 I wanted to keep the ratios of the ingredients like what one would find in the classic sandwich. Besides lots of toasty bread, this translates into loads of bacon and tomato…and just a little bit of lettuce. The result is sort of like a BLAT sandwich that exploded artfully on your plate…and since eating a good BLT/BLAT sandwich involves dripping juices and a stack of napkins, the salad is frankly much easier to eat. place them on a sheet pan and run them under the broiler. Watch the bread carefully and turn it as it colors until all the surfaces are by and large a light golden brown. There will probably be a few charred bits which may be scraped off—or left on, if that’s how you like it. Tear the now golden and toasty bread into bite-sized chunks. You may have some larger pieces…and some “fat crumbs” (to quote Rodgers)…but this will just add more texture and variety to your salad. 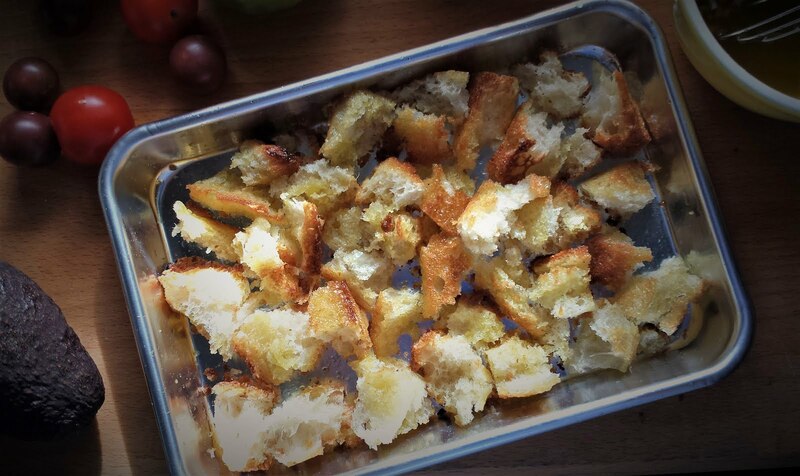 A half pound chunk of bread (weighed before removing the crusts) should produce about 4 cups of croutons. I have never made these ahead, but Rodgers mentions that they may be made a few hours ahead. (If I made them too far ahead there probably wouldn’t be any left by the time dinner rolled around…they are quite snackable…). I think they will be delicious anyplace you like to use croutons (salads, soups, pilafs, pastas, etc). In a salad they are particularly delicious when dressed with some of your vinaigrette—which not only adds flavor, but will soften them slightly. One note: You can control the ratio of crunchy bits to softer/chewier bits by altering the size of the chunks of bread to be broiled. If the chunks you begin with are large, you will have lots of softer/chewy interior. If they are smaller, you will have mostly crunch…with just a bit of chew. For this salad, I like them somewhere in the middle. (In her chicken salad, Rodgers leaves them larger…and softens them further by adding pan drippings from the roast chicken.) After you make them a time or two, you will get the hang of it and find how you like them best. The only addition to my BLAT salad that might seem surprising is the roasted corn. 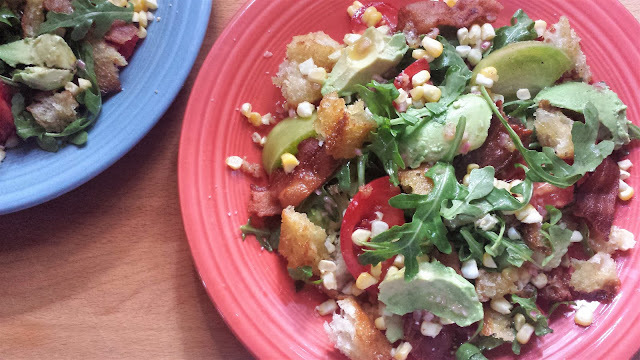 Corn is—to me at least—an obvious partner for tomatoes… and bacon… and avocado…. 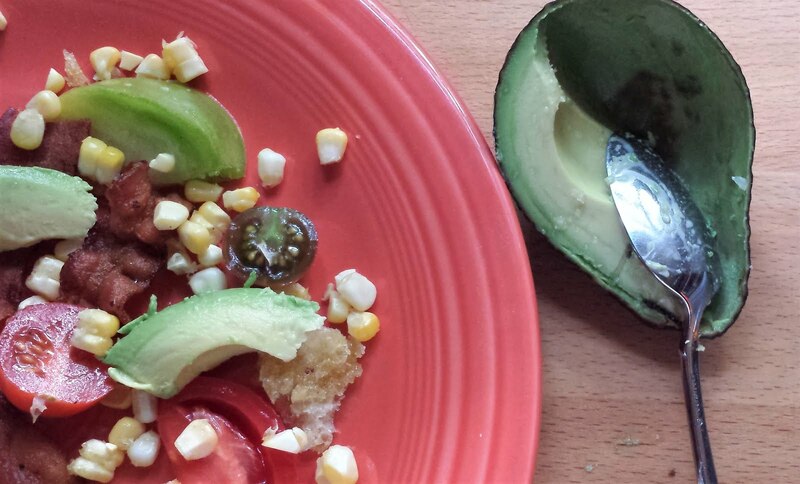 (If you follow me on Instagram, you will know I eat corn, tomato and avocado salads all summer long.) I have made this salad without it, but much prefer it with. Good, fresh, summer corn adds texture, pops of sweetness and moisture…and turns this salad into something out of the ordinary. As I said, you don’t really need a recipe for this salad. In fact, I hope you will just gather your ingredients they way you would if you were making a sandwich: in quantities to suit your taste. 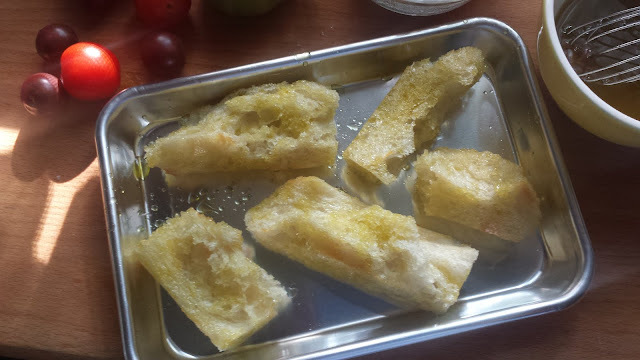 But since I know many people like to have a recipe for a starting point, I’m including a recipe for the vinaigrette and crouton… as well as estimates of how much of each ingredient I used for each person. Enjoy! Cut the tomatoes: Halve any cherry tomatoes. Large tomatoes should be cored and then cut in a variety of shapes—fat slices (half moon or round) and wedges. Spread the tomatoes on a platter, the cutting board or a sheet pan and season with salt and pepper. 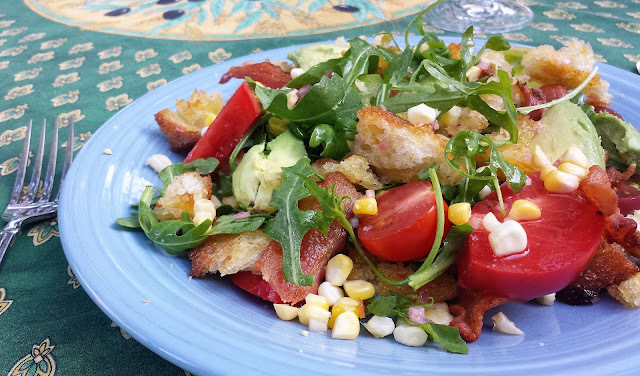 Place the greens in a small bowl (if you want to use fewer bowls, add the arugula to the bowl with the corn). Season and dress the corn and the arugula with a small amount of vinaigrette (don’t use too much—you can always drizzle more over the salad at the end). Dress the croutons with some of the vinaigrette (a tablespoon of vinaigrette for a cup of croutons is about right). Taste and season with salt & pepper if necessary. 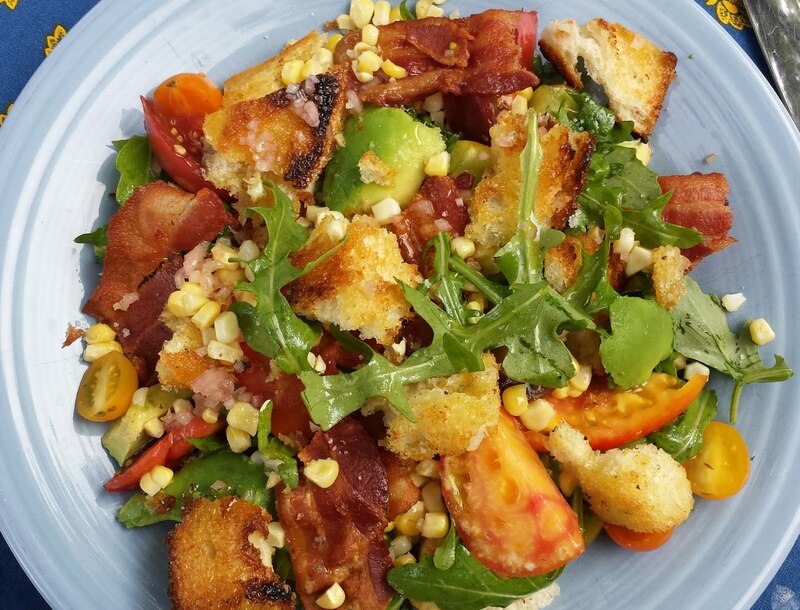 Arrange half of each of the tomatoes, bacon, croutons and corn on a platter or two individual plates. Take an avocado half and using a spoon, scoop bite-sized portions of avocado, arranging them in and among the ingredients already on the plate(s) as you scoop. Scatter all but a few leaves of the greens over all (see note). Repeat the first layer with the remaining ingredients and top with any remaining greens. Drizzle with more vinaigrette (and/or pass more separately). Finish the salad with a good grinding of black pepper and serve. 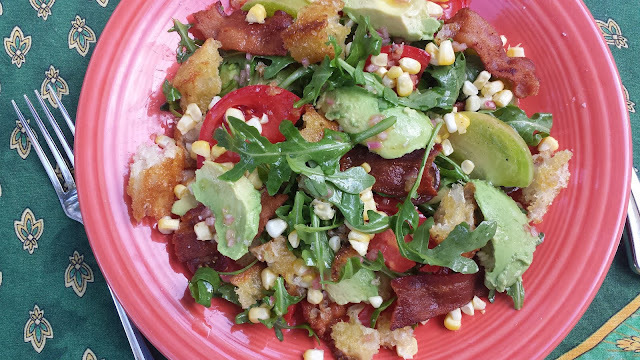 Note: If you dress the corn and arugula together, you will obviously be adding the corn to the salad in one layer…when you add the majority of the greens. Cut the crusts away from a chunk of day old baguette (or peasant bread...but nothing too grainy or hearty). Cut the bread into large chunks. Brush the chunks of bread all over with olive oil and place on a small sheet pan. Place the pan under the broiler. Watch carefully, turning the bread as it browns. Your goal is surfaces that are crisp and as uniformly golden as possible. When done, scrape away any bits that are too charred for your taste. 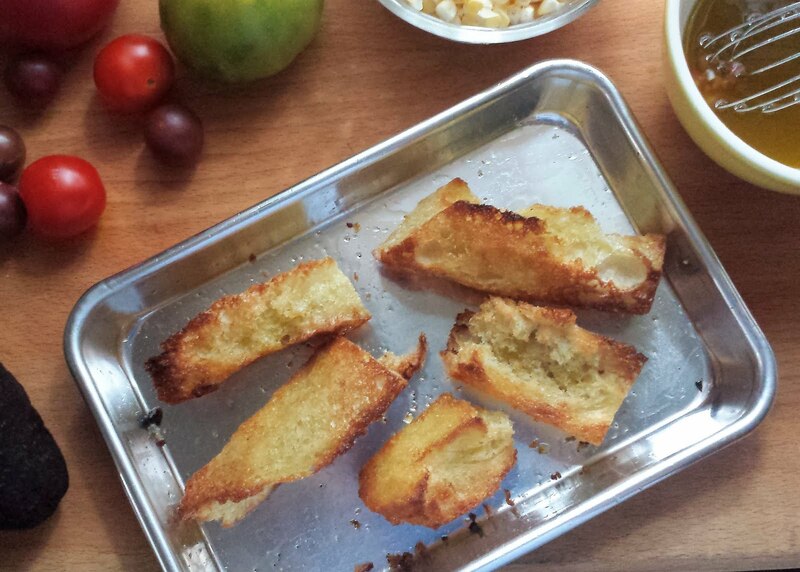 Tear the toasted chunks of bread into bite-sized pieces—you will have larger pieces as well as big crumbs. Set aside until ready to use. A half pound of bread (weighed prior to trimming away the crusts) should produce about 4 cups of torn croutons.